The petite Bhil woman with blue tattoos adorning her face and arms is the artist from village in Jhabua is known for her drawings of the flora and fauna of the region. She draws nature, rituals and festivals, Bhil gods and goddesses in the centuries-old Bhil style which is steeped in ethnic animism and spirituality. The tribal artist, like many other ethnic fresco painters of her generation, is making new statements through her art within the ambit of traditions. She switched to paper from the mud walls of her tribal home 25 years ago at Bharat Bhavan in Bhopal under the tutelage of Jagdish Swaminathan, who set up the art centre Roopanker in Bharat Bhavan in 1981. 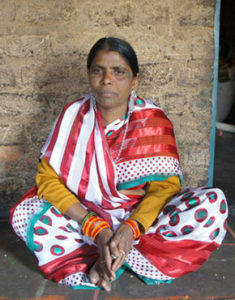 Ladoo Bai works as an artist at the Adivasi Lok Kala Academy.